© Posted on February 19, 2018, by Michael E. Newton. Ignoring the open question regarding the location of the wedding of Rachel Faucett and John Lavien, we will focus instead on the name given to the Lytton plantation. Was it known as the Grange when the Lyttons lived there? Was it known by that name when Rachel Faucett, Alexander Hamilton’s mother, was buried there? Or was it given this name sometime later? St. Croix’s property, tax, and census lists, known generally as the matrikels, record each plantation by their number and quarter. For the first sixty years that such records were kept, the matrikels do not give the names of the plantations. 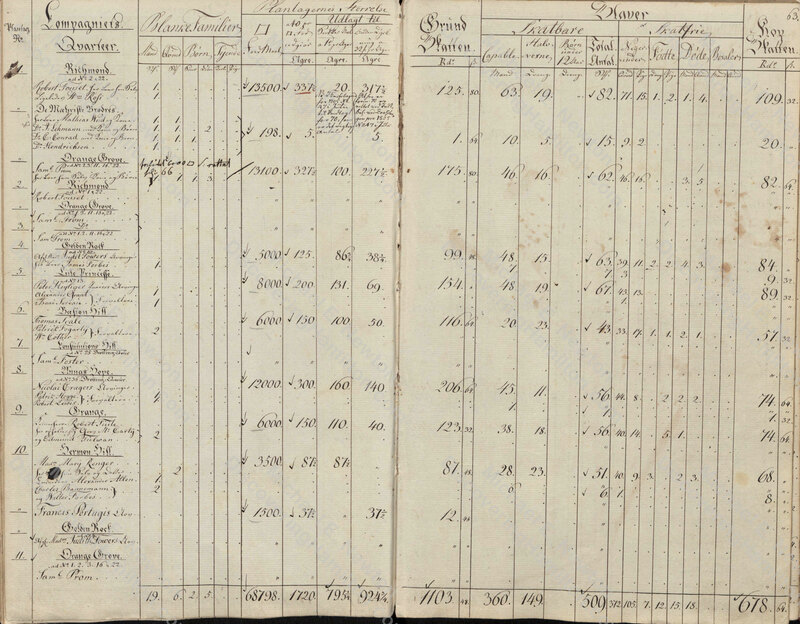 For example, here is the first page for Company’s Quarter in the 1763 matrikel, which includes James Lytton’s plantation at No. 9 Company’s Quarter. 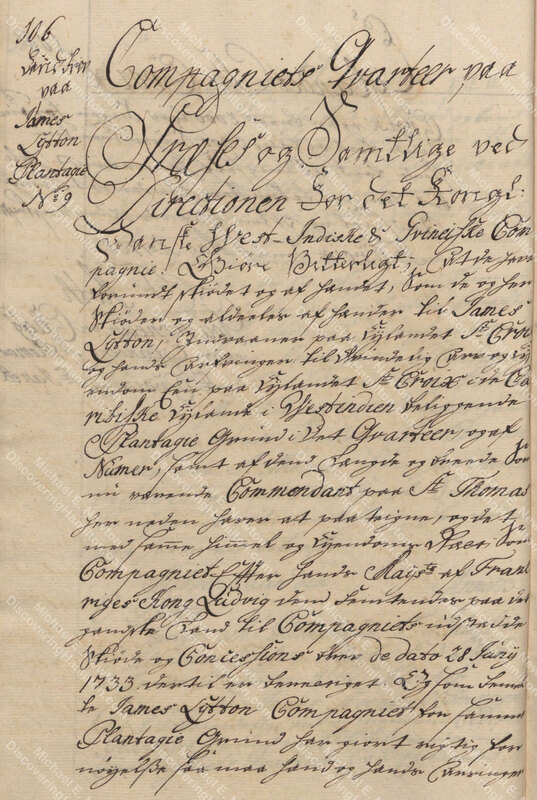 It was not until 1803 that the matrikels included the names of the various plantations. So when did No. 9 Company’s Quarter become the Grange? 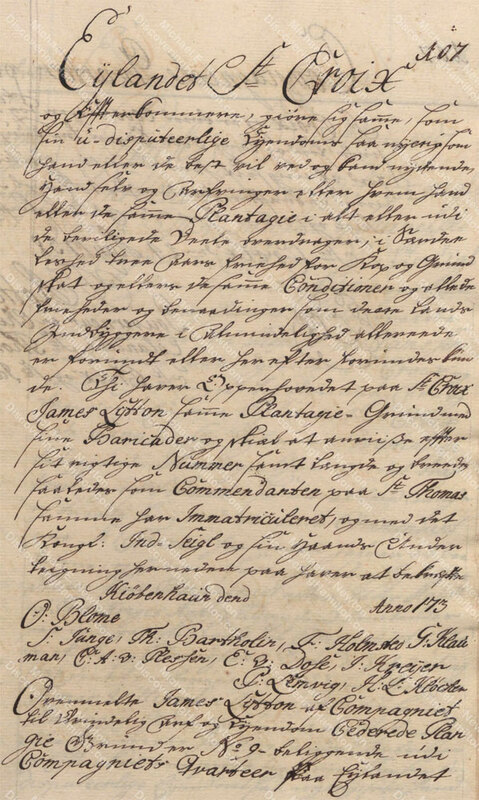 Was it in 1803 when the name first appeared in the matrikel? Or was it at some earlier date? 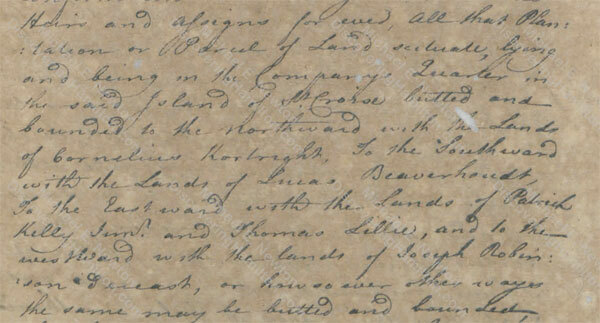 An extensive search through St. Croix’s records has yielded no mention of the Grange during James Lytton’s ownership of the plantation. 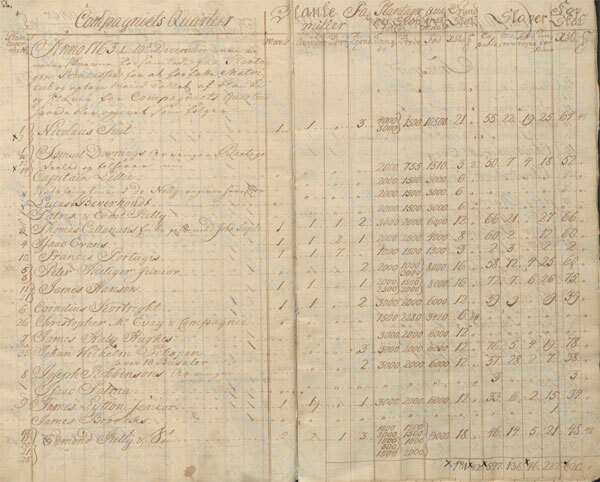 For example, the land deeds register compiled in 1751 lists “James Lytton Plantagie [Plantation] No. 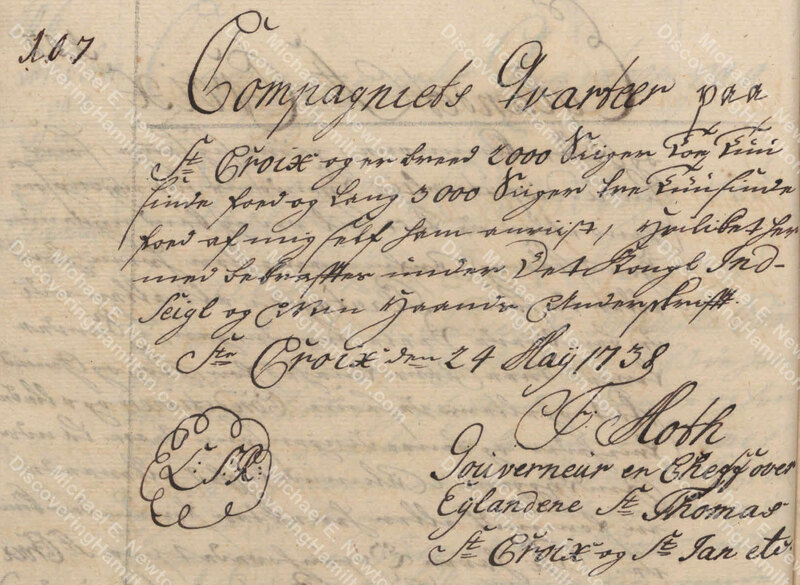 9” in “Compagniets Quarteer [Company’s Quarter].” No mention of the Grange is made. 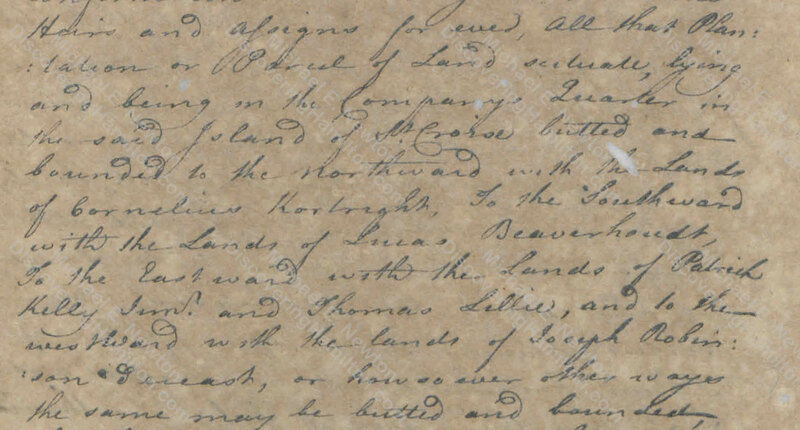 When James Lytton sold the plantation in December 1764 to John Denn (several months before the Hamiltons arrived on St. Croix), the “indenture” between them describes the plantation’s boundaries but does not call it the Grange. Of course, it is possible that the Lytton plantation was known as the Grange, officially or unofficially, even though this name has not been found in any record of the plantation during Lytton’s ownership of it. After never appearing in the records as the Grange during Lytton’s ownership of No. 9 Company’s Quarter, it is called the “Plantation Grange” just eighteen months after Lytton sold it and again just six months after that. This probably was no coincidence. 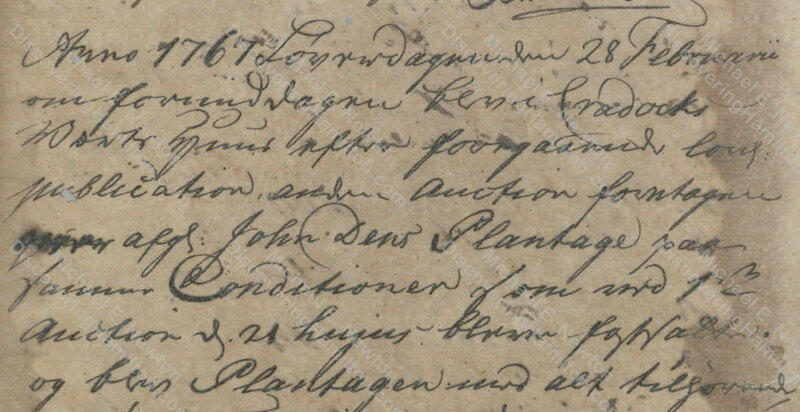 It is likely that it was John Denn who had given the plantation the name of Grange after he purchased it in December 1764. In the records going forward, this plantation is sometimes referred to as the Grange, other times as No. 9 Company’s Quarter, and other times by the name of the owner. For example, in February 1767, when the plantation was put up for auction, it is repeatedly referred to as “John Denn’s Plantation” but never as the Grange. 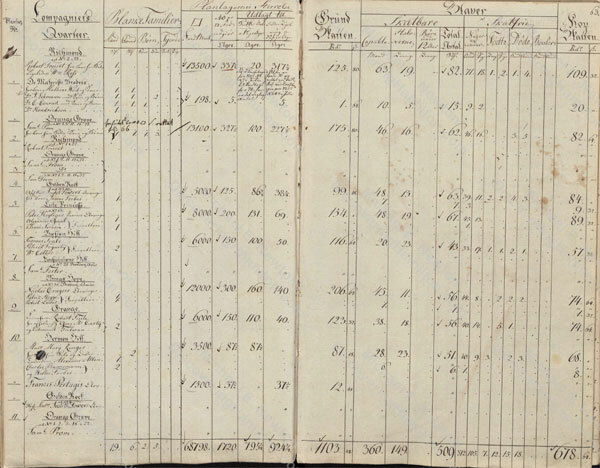 Likewise, in February 1768, when “Rachael Levine,” i.e., Alexander Hamilton’s mother Rachel Faucett Lavien Hamilton, was buried in the Lytton family graveyard, the property was described in the church burial record as “Mr. Tuite’s Plantation,” for the man who owned it at the time, without calling it the Grange. The above are just a few examples. There are many more instances from the years 1767 and onwards in which this plantation is sometimes referred to as the Grange, other times as No. 9 Company’s Quarter, and other times by the name of the owner. When Did the Grange Plantation Acquire Its Name? The inconsistency of the records regarding the name of this plantation and plantations in general makes it impossible to determine precisely when this estate first received the name of “Grange.” But there is sufficient evidence to draw a reasonable conclusion. Without any evidence that the plantation was known as the Grange while owned by the Lyttons, it would be incorrect to state that James Lytton built “a substantial estate” on St. Croix “called the Grange,” that the wedding of Rachel Faucett and John Lavien “took place at the Grange,” or that Lytton “sold the Grange,” without clarifying that it probably was not known by that name during any of those events. 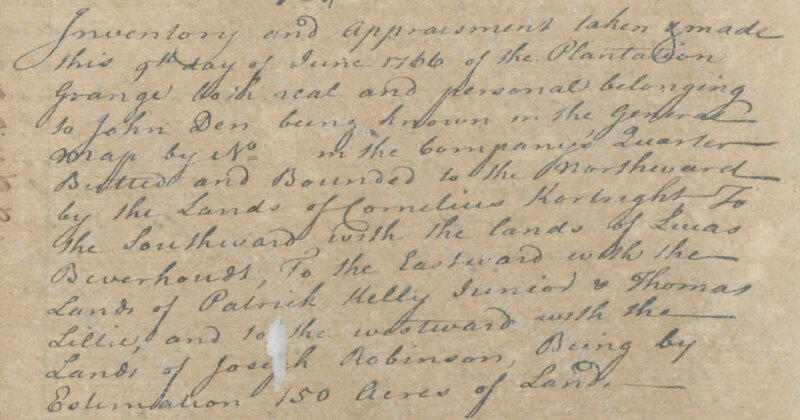 On the other hand, we see that this plantation was definitely called the Grange by June 1766. Thus, it certainly was known as the Grange when young Alexander Hamilton buried his mother in the Lytton family graveyard at No. 9 Company’s Quarter. Three decades later, when Alexander Hamilton built his home in Harlem, he named it the Grange, as his son wrote, “in commemoration of his family residence in Ayrshire [Scotland].” Undoubtedly, Alexander Hamilton had another reason to call it the Grange—as a recollection of the final resting place of his beloved mother. John C. Hamilton, History of the Republic 7:487. Newton, Alexander Hamilton: The Formative Years 1 and 505. 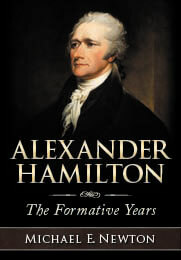 John C. Hamilton, The Life of Alexander Hamilton 1:2–3; John C. Hamilton, History of the Republic 1:42. Im Isabel Garrett from Ayrshire Scotland.The residence in Stevenston Ayrshire was originally Kerelaw after the ruined castle which still stands.The Hamiltons renamed the house the Grange after a previous dwelling in the Kilmarnock area. This house is of course now demolished.Interesting that he kept this link with Scotland.The last people to live in the house were the Campbells.Their son was a pilot in WW2 and was decorated for his bravery and posthumously awarded the Victoria Cross. Michael, I enjoyed reading your blog about the St. Croix Grange. It jogged a memory about my first trip to the island in 1986. My wife and I stayed at a resort called the Buccaneer which was owned by the Armstrong family. While there I mentioned to someone that I was an Alexander Hamilton descendant and was wondering if they knew if it was possible to visit the house. They told me that Mrs. Armstrong lived in the “Grange” and that she probably would not mind showing us the house. A visit was arranged. We were greeted by a young lady that said she takes care of Mrs. Armstrong. She said Mrs. Armstrong asked her to show us the “Alexander Hamilton Room” in the lower level of the house. It was a small room with a four post bed. The wall behind the headboard of the bed was carved stone. Very impressive. We were told that when Hamilton visited the house this is where he would stay. Afterward we were taken upstairs to what I would call a living room. All the furniture looked like antiques. We sat there for a few minutes and Mrs. Armstrong came into the room. She was elderly (about 90) but dressed in an attractive red house coat and her white hair was meticulous. She told us that the house was owned by her husband’s family and they bought it in the 1760’s. She told us that most of the furniture in the room where we were sitting was in the house when they bought it and that to her knowledge the furniture arrangement has NEVER changed. Apparently quite a few of the owners of the “old Plantation homes” take turns hosting tea parties and everyone strives to present the home as it looked originally. I asked about Rachael’s grave and she thought there was a small brick monument but that area was taken over by the tree’s and said no one has been “back there” in years. She also thought that water after one of the storms damaged whatever was there. I recall asking her if her family lived on the island very long. She said that the U.S. State Department sent her to the island just before WWII. When she tried to leave, German U-Boats prevented a safe return home. She met Mr. Armstrong, who turned out to be one of the wealthiest men on the island, married him, and has been on the island ever since. She then said she was originally from Indianapolis, Indiana. It was quite a visit! Reflecting now on that visit, knowing that AH’s history there is less than thought in 1986, but learning more everyday about “free-spirited” Rachael’s life, it is still her final resting place and that is good enough. Thanks for all the work you have done on this part of the family history. . When you hear stories like you did from Mrs. Armstrong, you don’t wonder whether it was true or false, but rather how much of it was true and how much of it was false, and which parts are which. Oral stories being passed down over a number of generations results in much mistake. No doubt there is some truth to what she said, but which parts are true and which are not makes it very difficult to rely on it.